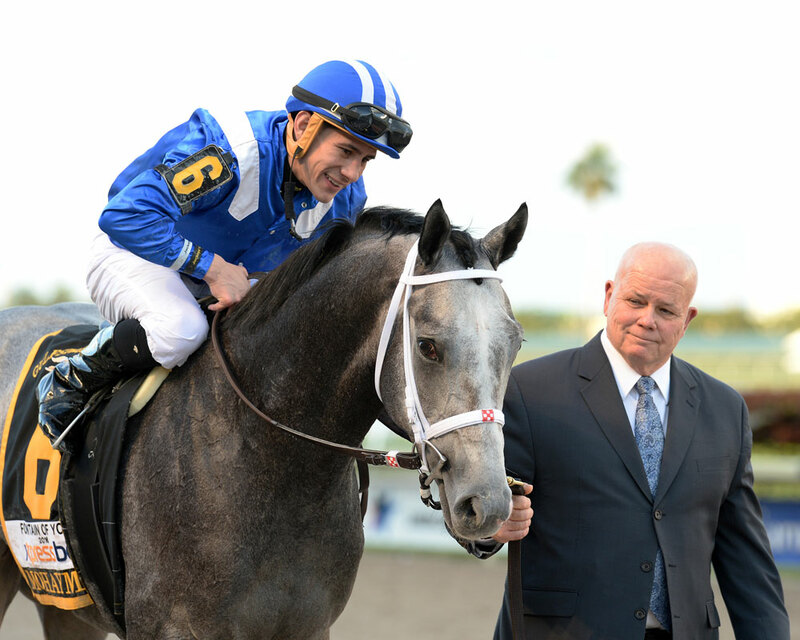 In the past seven years, trainer Todd Pletcher has dominated the Gulfstream Park Oaks (GII), saddling four winners, and this year he sends out the undefeated Nonna Bella, a full sister to last year’s Wood Memorial Stakes (GI) winner Outwork. 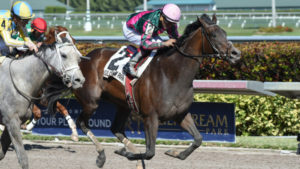 She will face a stern test, however, coming from the barn of Michael Matz with Forward Gal Stakes (GII) winner Tequilita. Owned by Matz’s wife, Dorothy, Tequilita is a daughter of the Matz-trained Belmont Stakes (GI) winner Union Rags and the Matz-owned and trained grade 2 winner Sangrita. The filly is riding a three-race winning streak; however all of those races were sprints and the farthest she’s ever raced is a one-turn mile. In her most recent start, Tequilita rallied from off the pace and held off a late charge from grade one winner Pretty City Dancer to win the Forward Gal. Matz has indicated that he is unsure whether or not the filly will handle the distance and mentioned the Ballerina Stakes (GI) or the Test Stakes (GI) as possible long-range goals should Tequilita come up short in her attempt to stretch out. Nonna Bella, who like her elder brother is owned by Repole Stable, also never has been around two turns. The daughter of Repole’s multiple grade 1 winner Stay Thirsty did not debut until February, where she won by a short neck going 6 ½ furlongs. She returned in a first level allowance five weeks later and won by a diminishing length over the very highly regarded Mark Casse-trained filly Corporate Queen. As with Tequilita, Nonna Bella’s trainer is unsure of how his filly will stretch out, but Pletcher is very happy with how the filly has been training and doesn’t think she could be coming into the race any better. Mark Casse has entered both Summer Luck and Salty in the race, but he is likely to scratch the former in favor of the Ashland Stakes (GI) at Keeneland next week. 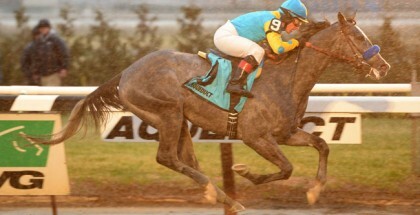 Salty debuted in the same race as Nonna Bella, finishing a neck behind that filly when she was trained by Ian Wilkes. Casse was so impressed with the effort that he purchased the daughter of Quality Road for Gary Barber, Baccari Racing Stable LLC and Chester Prince. Salty lived up to the hype, with an easy 2 ½-length win in her first start for her new connections. 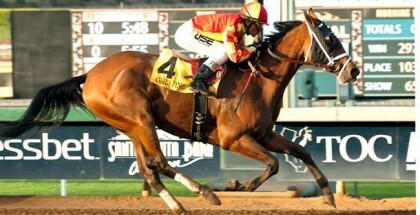 Should she run, Summer Luck who is owned solely by Gary Barber, will be aiming to improve on a fourth, and a pair of third-place finishes in the Gulfstream Kentucky Oaks (GI) preps this winter. Rounding out the field are maiden winners Spring Mist, Jordan’s Henny, Shezaprado, and Modacious, as well as the maiden Conquest Sorcerer. 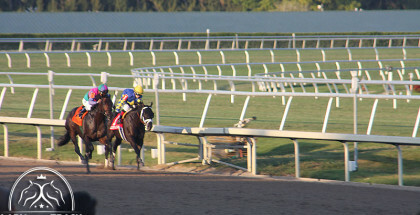 Carded as the 11th race on the program, approximate post time for the $250,000 Gulfstream Park Oaks is 4:57pm ET.